Oxygen OS Open Beta 30 for the OnePlus 5 and beta 28 for the 5T are now rolling out under the beta channel today. This new OTA update features latest April 2019 Android security patch level. It also brings some bug fixes and general improvements to the system. Important system upgrades include improvements to network speed display, The UI now supports shortcuts to access corresponding interfaces in Quick Settings. You can also quick reply in landscape mode from the notification panel. We get a new OnePlus Launcher with added tutorial in shelf, added parking location feature, and improved page indicator to mirror the icon pack you have applied. 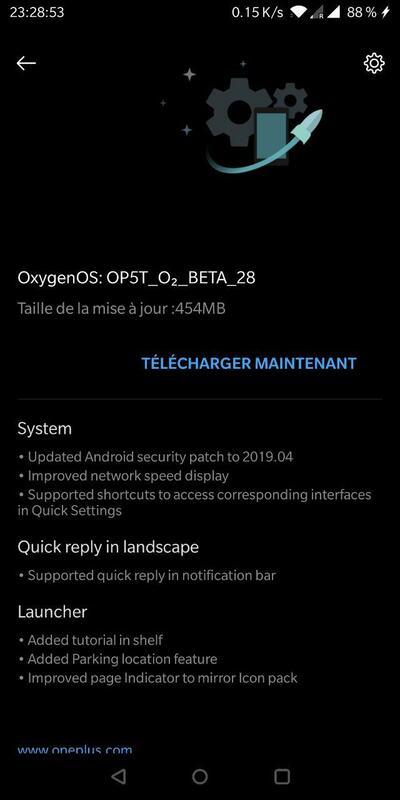 The previous betas featured Android 9.0 Pie based on Oxygen OS 9.0, March 2019 security patch, new OnePlus Launcher app, Messages app, OnePlus Switch app, and much more. We have also seen improvements to WiFi, Bluetooth, and carrier networks. So download and install the latest Open Beta 30 for OnePlus 5 and Beta 28 for OnePlus 5T; which has it all. Another reason to be on the Open Beta is that Google just released Android Q beta 2. Once the Android 10 Q is out as stable build, all the manufacturers along with OnePlus will start compiling the Android Q for their devices. It is very likely that OnePlus 5 and 5T will receive Android Q via Open beta to the beta channel first and later to the stable channel. Here we have listed the latest Oxygen OS Open Beta full stock firmware zips available for OnePlus 5 and 5T. The OTA update zip is readily available and can be easily installed using local upgrade method or directly flashing it using TWRP recovery. First, check if it has a compatibility zip. If it does remove it, create the zip and then flash it using TWRP recovery. If you need TWRP recovery, get it from the Oxygen OS 5.1.7 post. If you are looking for custom TWRP recovery or stock recoveries for the OnePlus 5 or 5T, then visit our previous previous post about Open Beta 29 for OnePlus 5 and Open Beta 27 for OnePlus 5T. You can directly upgrade from stable Oxygen OS channel or the previous open beta to this one using local upgrade method. Simply grab the ROM from below, transfer to phone storage, and do a Local Upgrade. Read: How to Update OnePlus 5/5T using Local Upgrade method. You can also see the installation method here at our post Oxygen OS 9.0.